Join us for a free bumblebee talk and walk in Glendalough, Wicklow Mountains National park. Although female bumblebees can sting more than once, they are on the whole unaggressive and rarely sting at all. The booming sound made by the wings of bumblebees is a characteristic sound of summer. Bumblebees are able to generate their own heat internally. Consequently, they are able to fly when cool weather conditions would put off other bees. Together with honeybees and solitary bees, bumblebees are important pollinators of native plants and crops. 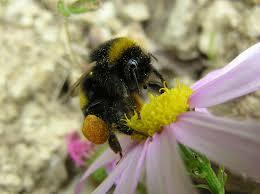 At least a third of Ireland’s 20 bumblebee species are threatened with extinction. Join us to learn about them and how to identify them. The workshop is aimed at beginners and consists of a short lecture inside followed by an identification walk. Location: The Education Centre, Upper Lake, Glendalough. Practicalities: Adults only. No dogs. This event is free of charge, but please be aware that the Upper Lake car park (Wicklow Co. Council) has a €4 charge. Booking: Booking is essential. To book, please phone 0404 45425. Bookings will be taken from Saturday 24 May. Wicklow Mountains National Park is managed by National Parks & Wildlife Service of the Department of Arts, Heritage and the Gaeltacht. The education programme is delivered by a small team of enthusiastic guides, based at the National Park Education Centre, Upper Lake, Glendalough. For more information about our education programme for schools and groups, please contact us at Tel: 0404 45656.